I found some chip board journals at Michaels the other day in their 50 cent bin. 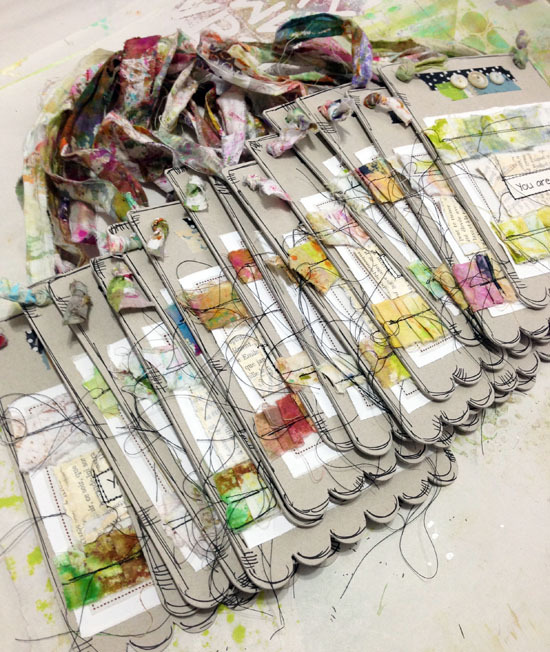 I rummaged around and found quite a few nice shapes and decided each piece could be altered into pretty door hangers. Have fun creating your own! 1. Use hole punch to add a second hole to the chip board shape. Doodle around the edges with a black pen. 2. Trim a piece of muslin or duck cloth to fit your base. 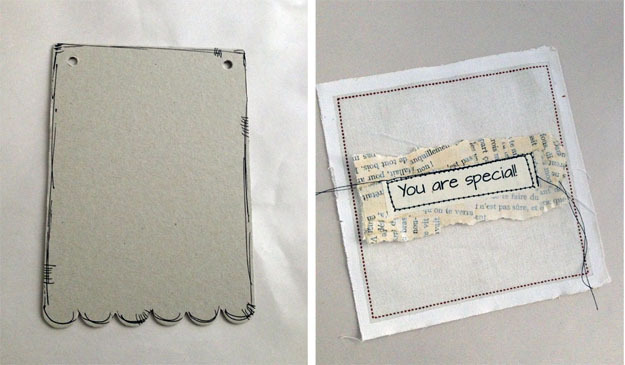 Stitch your phrase/quote to old book paper and stitch to fabric base. 3. Tear a strip of fabric and run it through the sewing machine, creating pleats as you stitch. 4. Cut your fabric strip so you have two pieces. Stitch them to your fabric base above and below your phrase/quote. 5. Using a glue stick, adhere your fabric piece to the chip board base. 6. Tear another strip of fabric and pull through the holes in chip board from back to front and tie each end in a knot. 7. Attach a variety of washi tape pieces to the top of the chip board base. 8. Using gel medium or glue dots, adhere a few buttons. These pretties are being mailed out soon and I couldn't bear to send them in plain envelopes so I stitched up some inky papers to create artsy envelopes and now I am happy!